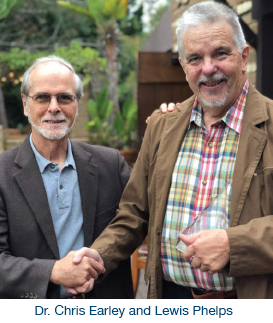 The RLS Foundation has named Lewis Phelps as recipient of the 2018 Ekbom Award. This prestigious award honors individuals who have enhanced the lives of people with RLS and made significant contributions to the RLS Foundation. Phelps, who is currently chair of the Board of Directors, has served for a total of 10 years on the board, including two terms as chair, in 2006–2008 and 2016–present. The RLS Foundation established the Ekbom Award in 1998. The award is named for Swedish neurologist Karl-Axel Ekbom, MD, who published early reports on the disease and first named it restless legs syndrome. Past recipients include Dr. Christopher Earley (2017), Roberta Kittredge (2016), Dr. Michael Silber (2014), Pickett Guthrie (2008), Dr. Wayne Henning, posthumously (2008), Robert Waterman (2007), Sheila Connolly (2005), Robert Balkam (2003), Cate Murray (2001), Dr. Richard Allen (2000) and Dr. Arthur Walters (1999). The RLS Foundation is grateful to the Ekbom family for allowing their name to be used for this distinguished award in honor of Dr. Ekbom and his work. Everyone’s RLS is different, there are many ways to relieve symptoms, and medical help is available for those who need it. 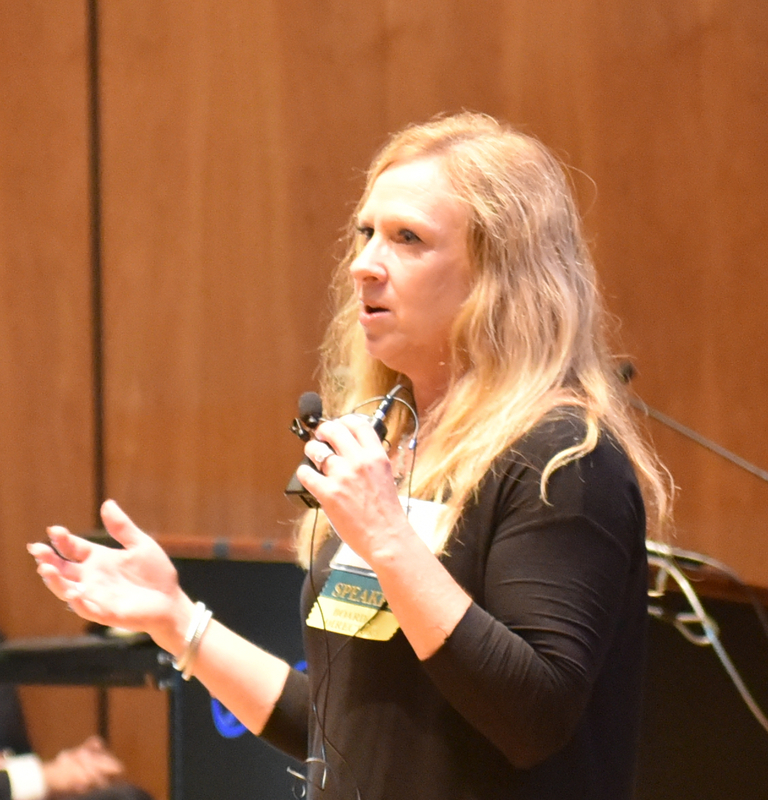 These themes and more were on the program at the RLS Patient Symposium on Sept. 29–30, 2018. 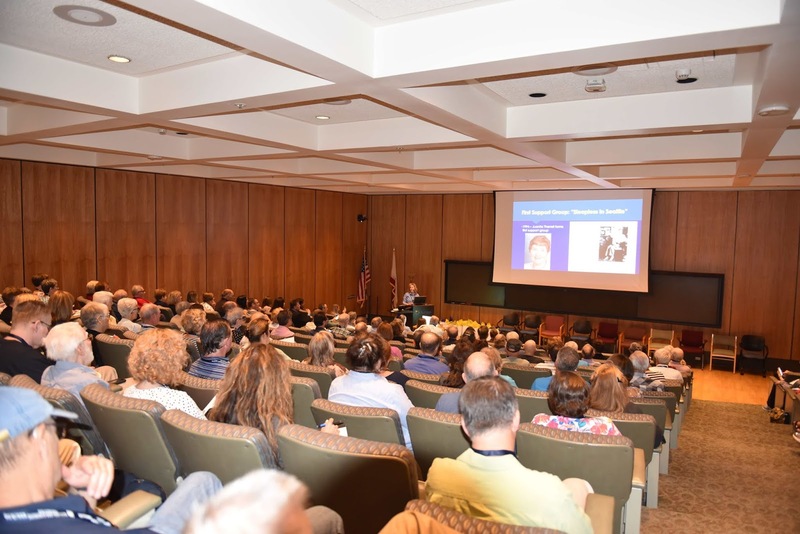 More than 150 RLS patients, spouses, partners, family members and medical experts gathered in La Jolla, California, for two days of learning about a wide range of topics in RLS treatment and research. The symposium included question-and-answer sessions with the speakers, and a “Dine with the Experts” event. Throughout the symposium, attendees used an app on their tablets or smartphones to ask questions, participate in polls, discuss topics, share photos and connect with each other. Many people with RLS share the experience of having suffered for years before receiving a diagnosis. 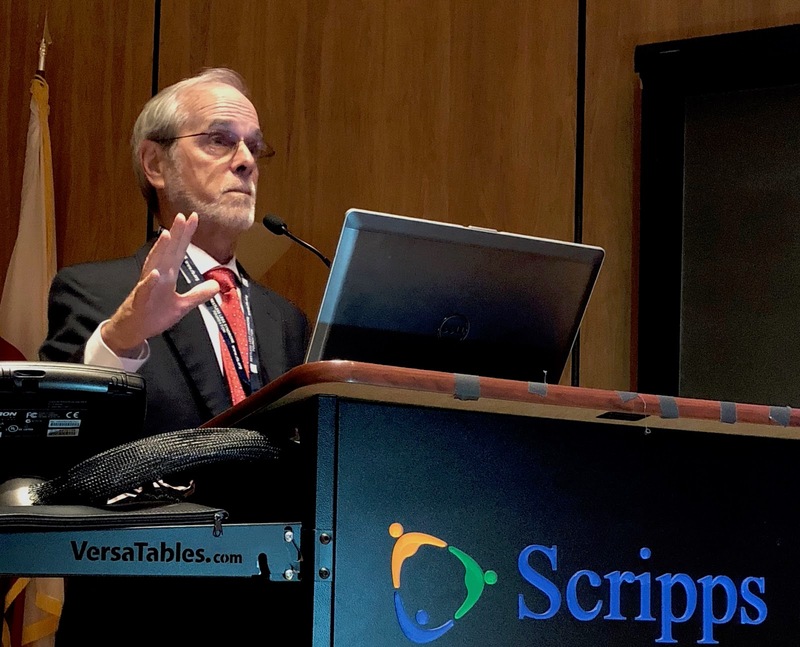 At the conference, J. Steven Poceta, M.D., of the Scripps Clinic Viterbi Family Sleep Medicine Center (a certified RLS Quality Care Center) gave an overview of RLS and the process of diagnosing patients. Dr. Poceta explained that about 90 percent of people with RLS also have periodic limb movements in sleep (PLMS). He also noted that for some individuals, RLS has an underlying cause such as low iron stores in the brain, renal failure, pregnancy, medications or neurological lesions. RLS often starts in childhood, and many adults who have RLS recall having their early symptoms being misdiagnosed as “growing pains” when they were young. 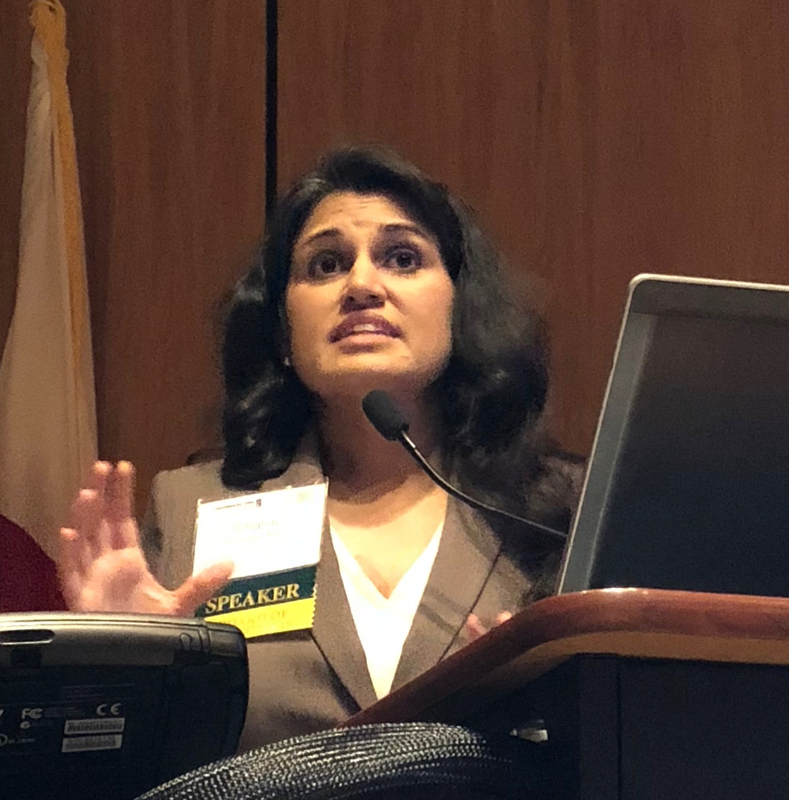 “Growing pains is RLS,” explained Shalini Paruthi, MD, of Saint Louis University, in a presentation on RLS in specific populations. RLS in children may also be mistaken for attention deficit hyperactivity disorder, and kids may not have the language to report their symptoms. About 70 percent of children have significant PLMS. Dr. Paruthi outlined the special considerations for diagnosing and treating RLS in children. She also discussed RLS in pregnant women, people with kidney failure, and people who have depression. Brian Koo, M.D., director of the Yale Center for Restless Legs Syndrome (a certified RLS Quality Care Center) gave an overview of the approach for RLS treatment in adults. The first step is to make sure the individual is using good sleep practices (sleep hygiene) and to reduce any obvious RLS triggers. If medication is needed, then providers can follow the step-by-step approach provided in the RLS Medical Bulletin (see page 23). Dr. Koo emphasized the importance of keeping an open mind if a physician suggests trying a medication that wasn’t effective in the past. “Just because you’ve tried a medication before and didn’t get a response, does not mean that this medicine does not work to treat your RLS. Other factors may have changed,” said Dr. Koo. In a separate talk, Dr. Koo presented information about PLMS, which occurs in 80–90 percent of RLS patients. The good news, said Dr. Koo, is that many RLS medications are likely to effectively treat PLMS at the same time. When drug treatments are needed, the mainstay are medications in two classes: dopaminergic agents and alpha-2-delta ligands. Mark Buchfuhrer, MD, of Stanford Sleep Medicine Center (a certified RLS Quality Care Center) gave a comprehensive description of how these medications work in the body, recommended dosages, and side effects such as impulse control disorder. In particular, he described how to prevent and diagnose augmentation, a common side effect of dopaminergic drugs. These medications may at first be very effective for treating RLS, but over time they cause symptoms to occur earlier in the day and spread to other body parts. Healthcare providers and patients alike must be aware of this devastating side effect and prepared to adjust treatment immediately if symptoms change. “Whenever a patient who has been on a stable treatment for at least six months requests more medication, it is augmentation unless proven otherwise,” said Dr. Buchfuhrer. If patients have tried all other RLS medications and their symptoms are severe and uncontrolled, then opioid medications should be considered. Opioids, despite any stigma they may hold, are very effective for RLS when used in small total daily doses. 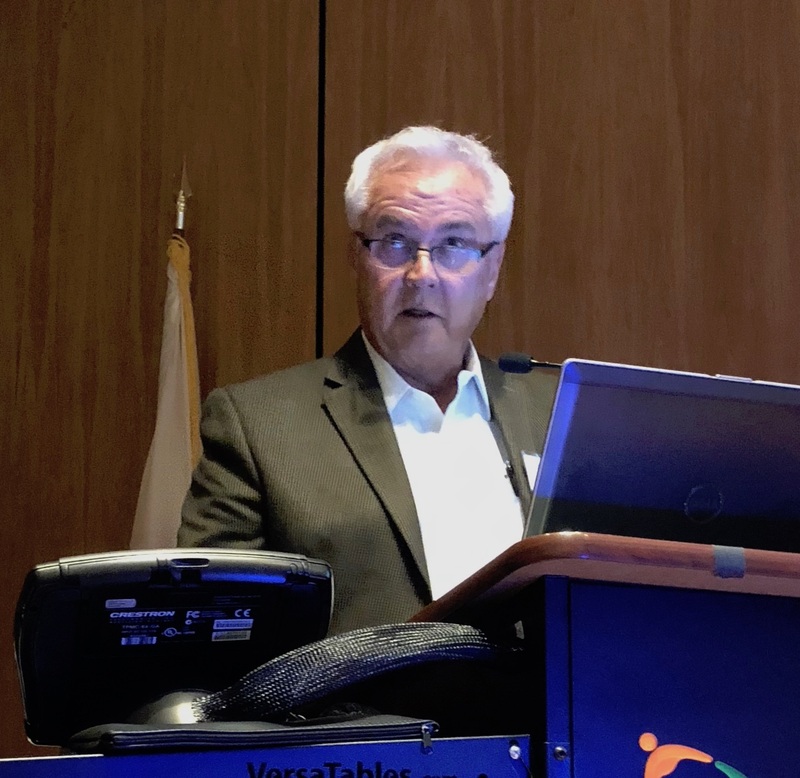 Christopher J. Earley, MB, BCh, PhD, FRCPI, of the Johns Hopkins Center for Restless Legs Syndrome (a certified RLS Quality Care Center), discussed the types of opioid medications available, how they work in the brain, and their appropriate use in very small doses to treat severe RLS. Several presenters discussed the role of iron in the brain and the importance of addressing low iron stores as a way to improve RLS symptoms. 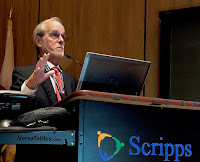 Richard P. Allen, PhD, of the Johns Hopkins Center for Restless Legs Syndrome, walked through the research studies that have demonstrated iron deficiency in the RLS brain. “It is very clear that it is brain iron, not peripheral iron, that is low in RLS patients,” he summarized. For some people, iron supplements taken orally or by IV infusion can help lessen RLS symptoms. William Ondo, MD, of the Houston Methodist Neurological Institute (a certified RLS Quality Care Center), gave an in-depth presentation on the process of iron regulation in the body. Iron therapy aims to increase iron concentration in the blood so that some iron can be transported to the brain. Dr. Ondo described the types of iron that can be taken for RLS, including a comparison of the different IV iron formulations available. RLS patients can also look to a variety of alternative therapies. 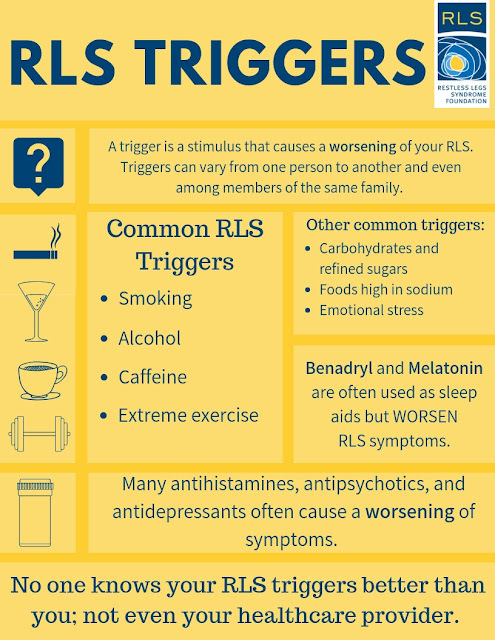 The key is for each individual to identify what triggers their RLS, and what makes their symptoms more tolerable, explained Jacquelyn Bainbridge, PharmD, of the University of Colorado. Examples of triggers include caffeine, nicotine, alcohol, lack of exercise, lack of sleep, extended sitting during long flights or meetings, low iron stores, and certain medications. On the other hand, things that may relieve RLS include stretching, moderate exercise, yoga, massage and other nondrug interventions. Individuals should work with their healthcare providers to explore strategies that may work for them. Dr. Bainbridge emphasized the importance of moderate exercise and nutrition in any RLS treatment strategy. Finally, she provided a comprehensive overview of medical marijuana as a strategy. Her message: more research is needed to optimize the potential use of medical marijuana for RLS. 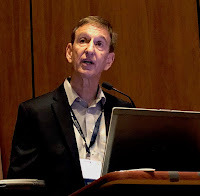 Jeffrey Durmer, MD, PhD, of Georgia State University, discussed the use of technology to help RLS patients – for example, cognitive behavioral therapy for insomnia (see page 12) and counterstimulation devices. Also, many apps are available that may help improve sleep by calming the mind and relaxing the body. Other technology devices can help create a cool and quiet environment in the bedroom, or enhance circulation in the body. Just as importantly, people must consider the negative effect of technology on sleep. Light-emitting devices reduce melatonin in the body, stimulating wakefulness. These devices should be kept out of the bedroom and should not be used within an hour before sleep, according to Dr. Durmer. Research has shown that several systems in the brain play a role in RLS. Dr. Earley explained the complex interactions that take place in brain cells, or neurons, that involve the neurotransmitters dopamine, glutamate and adenosine. Neurotransmitters are chemicals in the brain that act as messengers to transmit information from one neuron to another, sending the signals to areas of the body. Research has shown that in RLS, these systems are imbalanced. Common RLS medications are designed to work on the dopamine system (ropinirole, pramipexole, rotigotine) or glutamate system (gabapentin, gabapentin enacarbil, pregabalin). Many of these drugs are also used to treat Parkinson’s disease, where these systems are damaged, but the brain chemistry of RLS is different. In RLS, these neurotransmitters systems are imbalanced, and medications aim to correct this imbalance. In addition, opioid medications such as methadone and hydrocodone act on the morphine system. Recent findings on RLS and the neurotransmitter adenosine has sparked research into a potential new class of drugs to treat RLS by acting on the adenosine system. Genetics have been found a significant factor in RLS, according to a presentation by Dr. Ondo. He described what is known about genetic patterns in RLS, and the findings of various research studies. In 2007 an RLS Foundation-funded study by David Rye, MD, PhD, at Emory University School of Medicine uncovered the first genetic variant for RLS; as of today, 19 genes have been identified as associated with RLS. While this information does not currently help with diagnosing or predicting RLS, it has helped scientists better understand RLS and provides information for researchers who are working to develop an RLS animal model that could be used to test new potential RLS medications in the future. A third primary area of focus for RLS research is the role of iron in the brain. James Connor, PhD, of The Pennsylvania College of Medicine took a deep dive into the topic. According to Dr. Connor, it is believed that the RLS brain has plenty of dopaminergic cells, but they are not storing iron as they should. He described what is currently known about how the body transports iron from the blood into the brain, which occurs during iron therapy, and questions that scientists are exploring to better understand this process. The symposium opened with Dzienkowski sharing the organization’s history – from its origins around a kitchen table in 1989, to the 5,000+ membership of today. Lew Phelps, chair of the Board of Directors, closed by stressing the importance of ongoing support for the RLS Foundation’s work in education, treatments and research. “This is a membership organization, and membership is the life-blood of the Foundation,” said Phelps. He encouraged attendees to reach out to anyone with RLS who is not yet a member of the Foundation to invite them to join. The annual fee is only $35 (“a trip to McDonald’s, ” he said), and the Foundation offers scholarships to those who need financial assistance. 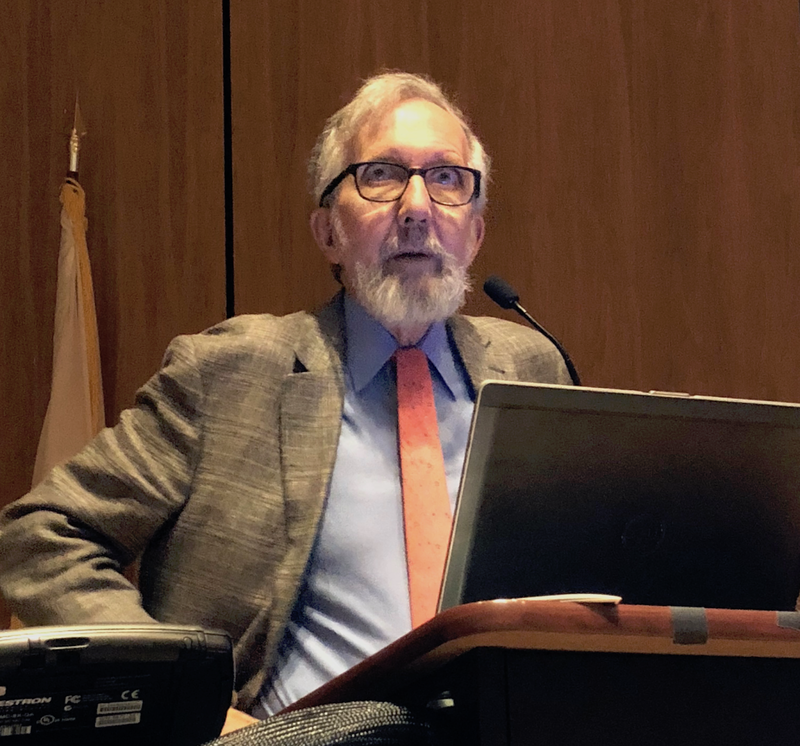 Phelps described the Foundation’s advocacy initiative to increase federal funding for RLS research and ensure that people with severe RLS continue to have access to opioid medications for treatment. The Foundation has held two series of meetings this year with members of Congress, the National Institutes of Health and the US Food and Drug Administration. The Foundation has also mobilized a grassroots campaign of letters and visits with elected officials; and in partnership with the Health and Medical Council of Washington, provided input on key legislation. Phelps noted that additional support is needed for this work to continue in the next fiscal year; the “magic secret” of the Foundation’s overall budget is members who step up and make additional contributions. “If you have the means, now is the time,” said Phelps. To make a gift to the RLS Foundation, visit www.rls.org or call 512-366-9109. RLS Awareness Day on Sept. 23, 2018 was a great success! At the Foundation, all of our social media channels were flooded with the hashtag #MakeADifference4RLS. Photos poured in from across the country of people holding the latest NightWalkers magazine cover with its eye-catching RLS awareness graphic. We invite you to view these images in the Awareness Day 2018 photo album on the Foundation’s Facebook page. Here is a staff favorite! Many members of the RLS community acted on our “10 Ways to Raise Awareness” list, while some created ways of their own to spread RLS awareness. The Foundation emailed an Awareness Day media packet to support group leaders that included a press release, media talking points, public service announcement and RLS fact sheet. 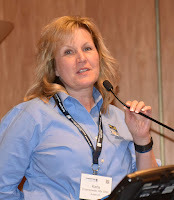 One of our long-time volunteer support group leaders, Mary Lou Mennona, emailed our press release to a number of Florida newspapers to spread the word about RLS. The chair of our Board of Directors, Lew Phelps, shared RLS information and resources through a neighborhood social networking channel. 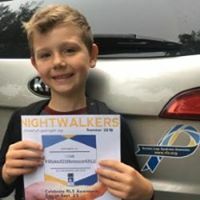 The child of a Foundation member wrote a report about RLS for school and shared a photo of himself holding NightWalkers magazine on Facebook. These are just a few of the many ways our community banded together to educate others about how RLS is a serious but treatable condition. Thank you to all who participated! Awareness and education are so important. At least 10 million people in the US have RLS, yet only about 5,000 have joined the RLS Foundation as members. It is our hope that by spreading awareness during September – and throughout the year – we can reach people who don’t yet know about the Foundation, and offer them the information and support they need. Although Awareness Day has passed, each of us can do our part and continue to spread the word: You are not alone! Help is available for those with even the most severe cases of RLS, which includes those experiencing augmentation. And the RLS Foundation offers hope, through programs to raise awareness, improve treatments, and fund research to find a cure. Learn more at www.rls.org. A trigger is a stimulus that causes a worsening of your RLS. Certain foods, beverages, medicines, excessive stress or exercise can be the source of a trigger. Triggers can vary from one person to another and even among members of the same family. For example, caffeine may be a trigger for one person but not another. All individuals with RLS can benefit from learning what triggers their RLS in order to avoid these substances. Sleep deprivation is known to worsen RLS symptoms. Good sleep habits such as maintaining a cool, dark sleeping environment, removing electronics from the bedroom to limit exposure to blue light and adhering to a schedule of bed and wake times are key to a restful night’s sleep. It is important to be knowledgeable about medications that are acceptable for use and those best avoided by individuals with RLS. Many prescribed and over-the-counter medications are known to aggravate RLS symptoms. The RLS Foundation Medical Alert Card lists important information about these medications on a small card that fits into your wallet so you can easily share it with your doctor, hospital and family members. Diphenhydramine (Benadryl) is an antihistamine commonly found in cold remedies and sleep aids; any over-the-counter medication containing diphenhydramine should be avoided. Decongestants like pseudoephedrine (Sudafed) can severely disrupt sleep for those with RLS. Contrary to popular belief, melatonin may worsen symptoms because of the serotonergic properties (serotonin regulates sleep, mood and appetite) found in the medication. St. John’s Wort, an herbal supplement believed to help with depressive symptoms, can cause a flare up of RLS symptoms in some individuals. Drugs in the antipsychotic (haldol and seroquel), anti-nausea (phenergan and compazine) and antidepressant (mirtazapine) medication classes are often the culprit for a worsening case of RLS. You should never discontinue use of a medication without consulting your healthcare provider, the RLS Foundation’s Medical Bulletin contains suggestions for safe alternatives to these medications to share with your physician. If you have an upcoming surgery, it is helpful to alert your surgical team to which medications they should avoid so they are prepared. Although certain medications may be hard to avoid, it is crucial to be vigilant about the ingredients in any of the medications you take. No one knows your RLS triggers better than you; not even your healthcare provider. When you are knowledgeable about your own triggers, you can avoid those substances before they worsen your RLS!